In Stock Cocomo-Order Online Now! Family-owned and operated since 1994, Cubicle Curtain Factory is proud to offer premium products at affordable prices, along with quick response and excellent customer service by our incredibly helpful sales team. Cubicle Curtain Factory specializes in Healthcare cubicle curtains, so you know you’re getting the best value for your budget. We guarantee with a one year warranty that you’ll be more than satisfied with the quality of our work. Q: When purchasing privacy curtains and Simply 66® snap cubicle curtains, does the curtain track come with my order? A: Hospital curtain track is not included in the price of your privacy curtain or Simply 66® snap cubicle curtain order. However, cubicle curtain track is available for purchase, and comes with everything you need to install with your cubicle curtains and Simply 66® snap cubicle curtains. We do not provide screws, as ceiling types vary significantly. Q: Are all polyester cubicle curtains or Simply 66® snap cubicle curtain fabrics fire-retardant? A: All of Cubicle Curtain Factory's privacy curtains and Simply 66® snap curtains meet all local, state and federal fire codes, and are intrinsically fire-retardant for the life of the fabric. This means that the flame resistant properties cannot be washed out, worn out or removed from the privacy curtains or Simply 66® snap cubicle curtains. Not all cubicle curtain polyester fabrics comply with the required NFPA 701 fire code. Q: What is the product warranty when we buy Cubicle Curtain Factory privacy curtains, Simply 66® snap cubicle curtains and/or cubicle curtain track hardware? A: Cubicle Curtain Factory has a one-year warranty on all cubicle curtain and track products and Simply 66® snap cubicle curtains. This covers the quality of materials and workmanship in all of our hospital curtains. Q: How long will it take for me to receive my privacy curtains or Simply 66® snap cubicle curtain order? A: When ordering cubicle curtains and/or Simply 66 snap cubicle curtains, lead time depends on the fabric you choose. We have a wide selection of in-stock hospital cubicle curtain fabrics. These in-stock cubicle curtains and Simply 66® snap cubicle curtain patterns normally ship within 1-2 weeks with receipt of order. Orders for privacy curtain track normally ship out in 48 hours. Once we receive a quotation request from you for cubicle curtains or Simply 66® snap hospital curtains, we will notify you of the approximate lead time for delivery of your cubicle curtain or Simply 66® snap privacy curtain order. Rush orders are also accepted, however the lead time depends on our production schedule. Q: When ordering cubicle curtains, does the curtain track or any hardware come included? A: Not automatically. 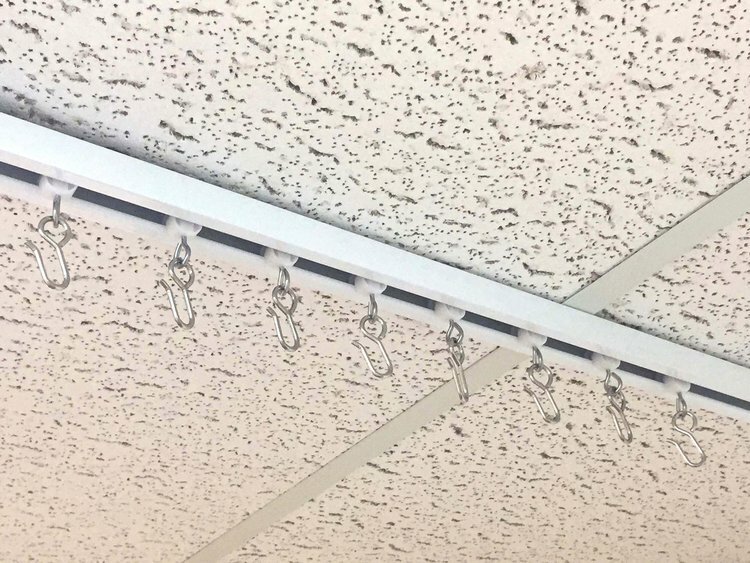 Cubicle curtain track is ordered in addition to cubicle curtains, however when you do order cubicle track kits from CCF, all components (hardware such as carrier hooks, connectors/splices, end gates and stops) are included in the price per foot. Because ceiling types vary greatly, we do not provide screws with your hospital curtain track or hardware purchase. Visit our privacy curtain track page for more information, or call us at 800.588.9296. Q: Can CCF install my hospital curtains and cubicle track? A: Yes. Cubicle Curtain Factory offers cubicle curtain installation and hospital track installation services throughout the USA. Just let us know you would like a quote for installation services along with your quote for medical curtains and cubicle track. A: The average lead time for cubical curtain track and hardware to ship is 48 business hours from receipt of order. Orders for privacy curtains have an average manufacturing time of 1-2 weeks, however it depends on our production schedule. If the cubicle curtain fabric is in stock at our facility, your order will ship within that average time. Ask one of our sales reps to provide you with fabric options if you need your cubicle curtains in a hurry. Please keep in mind, most in-stock fabrics are solid patterns, and designer patterns may have to be ordered from the fabric mill. In this case, the lead time depends on the availability from the fabric mill, which we have no control over. 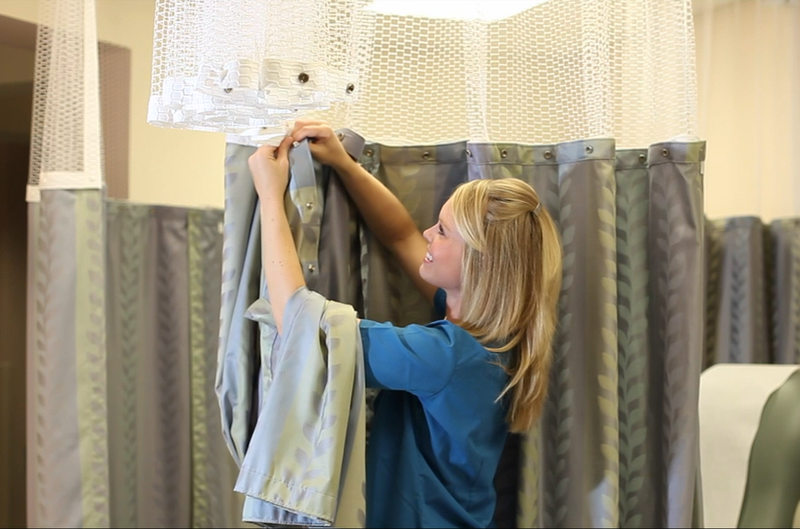 We do, however, have control once we receive the cubicle curtain fabric, and that's when our average lead time applies to manufacture your hospital curtains, unless otherwise noted on your estimate. We also accept rush orders - please notify your sales rep if you need your order rush shipped or manufactured. Additional charges may apply. View additional questions and answers about our cubicle curtains and track.